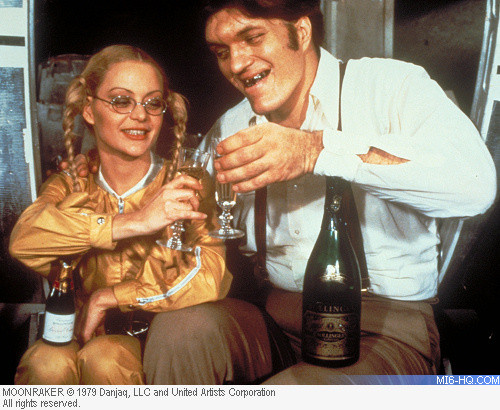 Born in Detroit, Michigan, on September 13th 1939, Richard Kiel became a full time actor in 1960 after numerous odd jobs including a nightclub bouncer, a cemetery plot salesman and a night school math instructor. His distinctive height and features are a result of a hormonal condition known as acromegaly. At his tallest, Kiel stood 7 feet 1.5 inches. Throughout the decade he carved a name for himself in television bit parts. He appeared in a TV pilot based on the comic, 'The Phantom' in '61 and had guest roles in 'Thriller', 'The Rifleman' and 'The Twilight Zone'. Because of his build and stature Kiel often ended up in unflattering roles in low budget horror films, such as 'Eegah' (1962) or 'The Human Duplicators' (1965). In 1964 he appeared in the pilot episode of the soon-to-be hit spy-fi, 'The Man From U.N.C.L.E. ', alongside regulars Robert Vaughn and David McCallum. He was uncredited for his part but was welcomed back in '65 for the role of Merry in the episode 'The Hong Kong Shilling Affair'. In 1965 he wrote his first screenplay and the same year landed a semi-regular role in CBS's Robert Conrad starrer 'Wild, Wild West.' Kiel played the menacing henchman Voltaire. In the early 1970s he earned a regular role on Western-set comedy, 'Barbary Coast' where Kiel played in all 13 of the season's episodes alongside William Shatner and Doug McClure. Kiel's role was that of Moose Moran. He also landed a bit part in the successful 1974 comedy, 'The Longest Yard' about the former pro American football quarterback, Paul Crewe, as played by Burt Reynolds. He was considered for the title role in a 1977 TV adaptation of comic 'The Incredible Hulk'. Also auditioning was a young Arnold Schwarzenegger, who was rejected for his height. Kiel worked on the production and filmed two episodes of the series before the producers decided although Kiel was tall, he was too slight for the role. 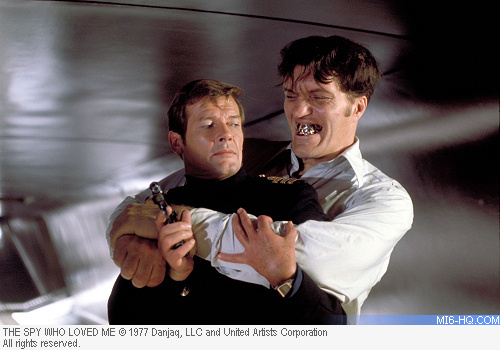 Despite the loss of that iconic character, Kiel auditioned and won the role of Jaws in 1977's 'The Spy Who Loved Me'. His unique stature and glimmering teeth making him a fan favourite henchman from the moment the film hit the cinema. 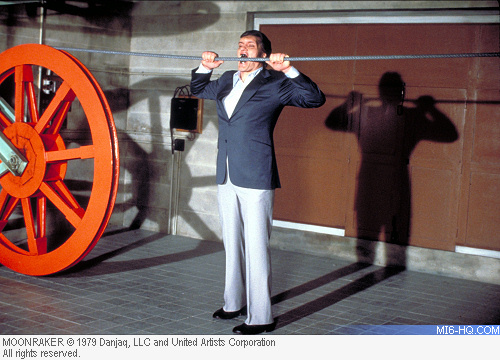 Jaws was so popular with audiences that producers brought him back in 'Moonraker'. "I think that Jaws is popular because he is the underdog and he is very determined, he would brush off his clothes and straightened his tie and keep going. And I think people enjoy that, he wasn't quite as predictable, you weren't sure if Bond was going to kill him or he was going to kill Bond. So they made it a little more fun." On his second Bond outing in 'Moonraker', the writers made the most of the comic elements to Kiel's silent character and paired him up with Blanche Ravalec who played his unlikely lover, Dolly. 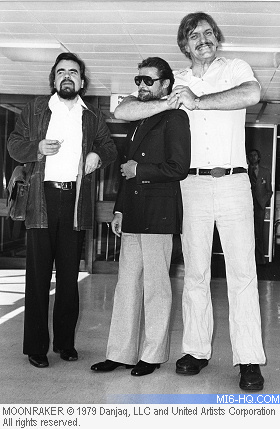 The filmmakers did not think that viewers would accept the relationship between Jaws and Dolly due to the height difference between them. Her role had been written for a giant lady to match Jaws' own size. It was only when Kiel pointed out that his actual wife was the same height as Blanche that they changed their minds. Kiel suffered from acrophobia, and during the cable car stunt scenes in 'Moonraker', a stunt double was used because Kiel refused to be filmed on the top of a cable car at over 2000 feet high. The Bond films threw Kiel into international stardom and even casual viewers came to identify his character as an icon of the Bond franchise. He would work with Burt Reynolds again on the 1984 adventure comedy, 'Cannonball Run II' which also had cameo appearances from rat packers Dean Martin and Frank Sinatra. The original film 'Cannonball Run' had starred Roger Moore, but in the follow-up, Reynolds shares the screen with co-star Dom DeLuise. He co-wrote and starred in the 1991 movie 'The Giant of Thunder Mountain' for director James Roberson. One of the passions Kiel held closest to his heart was the life story of Cassius Clay. The 2007 book 'Kentucky Lion: The True Story of Cassius Clay' was a labour of love for Kiel, who spent 25 years researching Clay. "What I wrote about was the white man who did more to end slavery except for Abraham Lincoln," Kiel told MI6 in an exclusive interview back in 2003. "It's kind of like a 'Schindler's List' but it's about America's struggle with slavery. The original Cassius Clay freed all of his slaves when he was very young and inherited his father's estate, his father was one of the richest men in Kentucky. The guy was a hero to the black people long before the emancipation of proclamation of the thirteenth amendment." To honour Clay's legacy, Kiel donated half his royalties to a scholarship fund for financially disadvantaged students. In 1992 Kiel suffered serious injury in a car crash, effecting his balance. Since then he limited his on-screen appearances and his last big role was as Mr Larson in 1996's 'Happy Gilmore'. He has since regularly appeared at fan and signing events across the world and fronted the launch of Swatch's Bond villain watches. In 2002 he released an autobiography of his career: 'Making It Big In Movies' and in 2004 returned to the 'role' of Jaws once more in EA Games' adventure 'Everything or Nothing'. His likeness was also used for the 2012 game '007 Legends'. "Unfortunately I have never had the teeth, they have been in a safe somewhere with the Bond producers. The guy that made them was a dental technician near Pinewood and he could only make the one set, so there is only one real set out there." Kiel was due to appear at a James Bond convention in Kankakee, Illinois, on Saturday 6th September 2014 but had to cancel due to breaking his leg after a fall at his home and was hospitalized in Fresno, California. 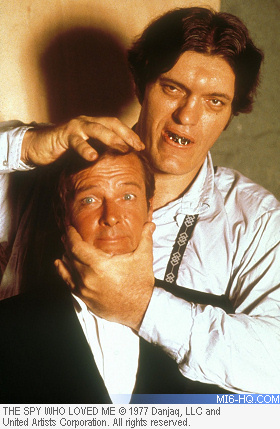 Richard Kiel passed away in hospital a few days later on Wednesday 10th September 2014 at the age of 74. He is survived by his wife Diane Rogers and his children. His family posted this message to fans around the world: "It is with very heavy hearts that we announce that Richard has passed away, just three days shy of his 75th birthday. Richard had an amazing joy for life and managed to live every single day to the fullest. Though most people knew of him through his screen persona, those who were close to him knew what a kind and generous soul he was. His family was the most important thing in his life and we are happy that his last days were spent surrounded by family and close friends. Though his passing was somewhat unexpected, his health had been declining in recent years. It is nice to think that he can, once again, stand tall over us all.